French physicist who made contributions to quantum wave mechanics and won the 1929 Nobel Prize for Physics in recognition of his discovery of the wave nature of the electron. 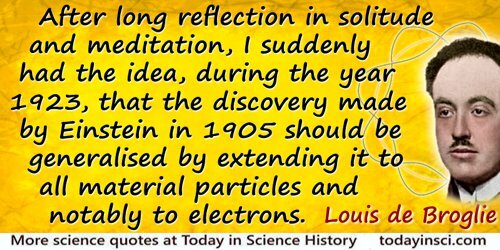 After long reflection in solitude and meditation, I suddenly had the idea, during the year 1923, that the discovery made by Einstein in 1905 should be generalised by extending it to all material particles and notably to electrons. Preface to his re-edited 1924 Ph.D. Thesis, Recherches sur la théorie des quanta (1963), 4. In Steve Adams, Frontiers (2000), 13. Many scientists have tried to make determinism and complementarity the basis of conclusions that seem to me weak and dangerous; for instance, they have used Heisenberg’s uncertainty principle to bolster up human free will, though his principle, which applies exclusively to the behavior of electrons and is the direct result of microphysical measurement techniques, has nothing to do with human freedom of choice. It is far safer and wiser that the physicist remain on the solid ground of theoretical physics itself and eschew the shifting sands of philosophic extrapolations. In New Perspectives in Physics (1962), viii. 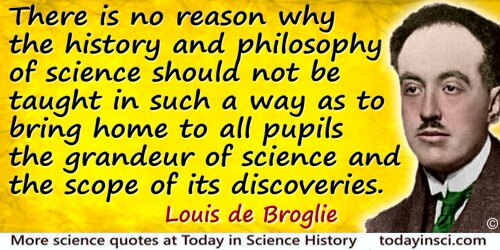 There is no reason why the history and philosophy of science should not be taught in such a way as to bring home to all pupils the grandeur of science and the scope of its discoveries. New Perspectives in Physics (1962), 195. Thus with every advance in our scientific knowledge new elements come up, often forcing us to recast our entire picture of physical reality. 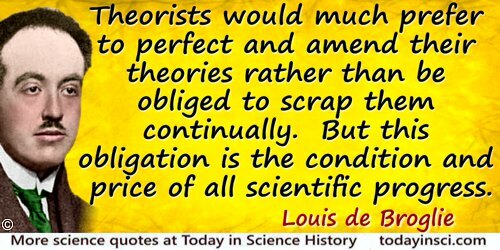 No doubt, theorists would much prefer to perfect and amend their theories rather than be obliged to scrap them continually. But this obligation is the condition and price of all scientific progress. New Perspectives in Physics (1962), 31. 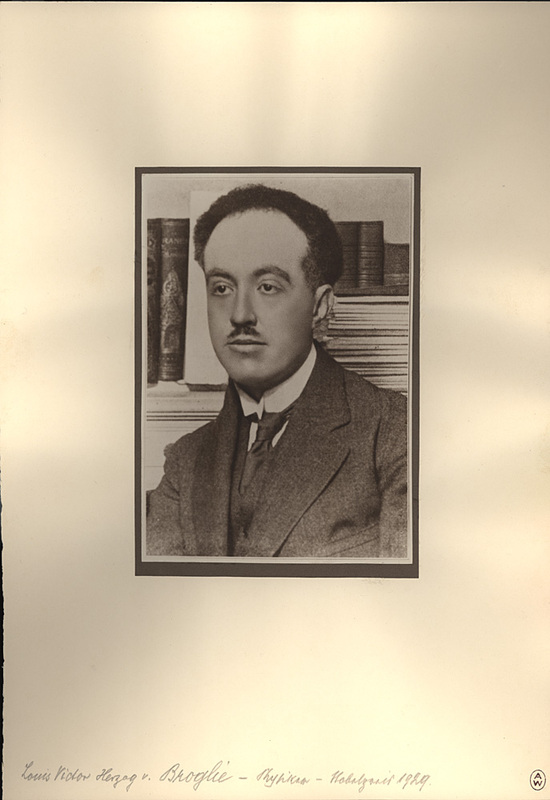 Long may Louis de Broglie continue to inspire those who suspect that what is proved by impossibility proofs is lack of imagination. In 'On the Impossible Pilot Wave', Foundations of Physics (Oct 1982), 12, No. 10, 989-999. Reprinted in Speakable and Unspeakable in Quantum Mechanics (1987), 167. 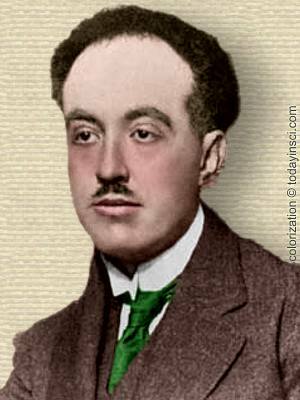 15 Aug - short biography, births, deaths and events on date of Broglie's birth.